very good exercise! intense but bearable! learn something new in krav maga, instructor was funny and friendly. Good for a try. Very intense but very enjoyable. It's a total workout of body in just an hour. First class. Could not understand the instructions by the coach (too soft, language barrier I suppose) . Saving grace is classmates were helpful and friendly. Overall good workout. It's tough, but go at your own pace. The instructor was very encouraging though. So try your best and you'd be fine. Nearly died, but good workout! Krav Maga by Mike. Useful self-defense techniques. 30 mins warm up drills, 1 and half hour skill lesson. cute trainer lol. and intense workout of course. Instructor gives specific instructions and demonstration on new moves. He corrects our posture every now and then so that we dont hurt ourselves. Recovering from an ankle injury, and this is probably the safest way of easing back into training. Louis has very practical and effective partner drills, with a string suspended across the gym. The class was enjoyable and easy going, perfect for slowly getting back into the swing of things. Great session and I was a bit sore after, but Muayfit is definitely a place I'm returning to. much more of an interesting learning experience than an intense workout. couldn't really hear the coach very well and the gym was quite poorly lit. regardless of that, very fun experience and would definitely come again. Blasted my body..must have good stamina to survive the session >~<"
I'm absolutely in love with this gym and ALL their instructors. Even their staff is super friendly. Great workout! Class was great and the instructor was really friendly. It was quite a big class with 16 women of different kinds of fitness levels. If u really want to get in shape and have strong will power, then this is your class..
Richard was good as usual! My shirt was drenched in sweats! Great workout and good experience! very intense workout early in the morning, much focus in physical training. only 3 attendees including me during this session. nice. The coach had a separate session for the first timer to make sure we know the basic. Enjoyed the intensity and can't wait to go again! the best class i hv attended thus far. weed is really a good couch! highly recommended!! first receptionist that aware of kfit participants. kudos! Great environment with great trainers. Learn a lot from this! Really got my heart rate up! was my first time but really enjoyed the personalised teaching. Intense for a beginner (Krav Maga) but definitely something great to learn especially for the girls. Coach was very interactive with the students. Muayfit is probably the most well-known martial art gym in Kuala Lumpur, and is the only gym in town to house a fully qualified Krav Maga instructor! They also boasts some of the best instructors - ONE Championship superstar Peter Davis, UFC veteran Will Chope, MMA star Nick Harris, 3rd degree black belt Professor Pedro, and Olympian Saeed Chapari! Muayfit also has one of the largest mat spaces for Muay Thai. Their centers are equipped with various workout facilities, namely uppercut and hook stations, TRX Suspension Training Systems, Multi-Fintess Station, Power Plate vibration machines, and many others. They also offer group and personal training in many disciplines, including Muay Thai, MMA, Urban Warrior, Brazilian Jiu Jitsu, etc. Muayfit operates in 5 branches across Klang Valley - Petaling Jaya, Kuala Lumpur, Damansara Perdana, Kota Kemuning, and Puchong. 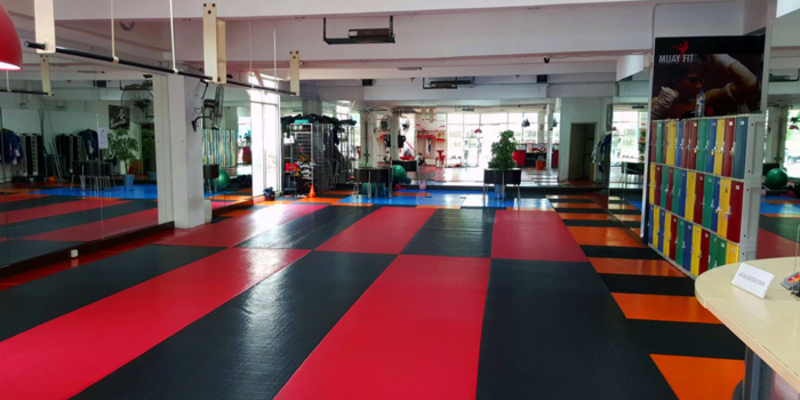 There are no activities available for Muayfit MMA Gym 3 Two Square.